Of course, recycling used hardware saves natural resources – so our customers are actively contributing to environmental and climate protection. In cooperation with the environmental organisation Plant for the Planet, in 2017 we continued our tradition of donating one tree for every refurbished router or switch we sell. To conclude: this year, thanks to our customers, we were able to plant 1,391 trees! Dense forestation on our planet helps reduce the effects of emissions of the greenhouse gas carbon dioxide. Even with tiny steps, we can contribute to making our world a better place to live and halting climate change. Our philosophy at Green IT Solution is to offer innovative network technology as well as refurbishing used hardware to a professional standard and putting it back on the market again. IT products have a very short life: after just a few years the technology is outdated. Our work extends the product life-cycle. This saves resources, not just by reusing precious materials, but also by avoiding transport. People who buy our products are thinking sustainably and helping to protect natural resources. By donating a tree for every refurbished router or switch we sell, we encourage their involvement even more. Our customers recently received the Green IT 2017 certificate, with which we thank them for their commitment. At the same time, each of these tree donation certificates documents the success of the individual customer: we calculate precisely how much water was saved and how much less CO2 was emitted in the past year thanks to their purchases. If you look at the eco-balance of IT equipment (often imported from the Far East), the extremely high water consumption and considerable CO2 emissions are clear to see. For an average business router, for example, around 60 to 65 percent of this is due to its manufacture and transport to Europe or America. 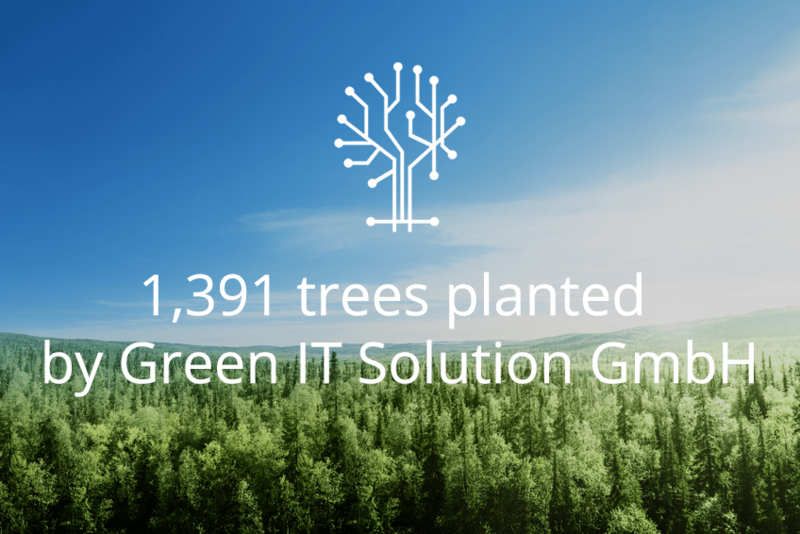 Buying refurbished equipment saves natural resources – and at Green IT Solution the figures for 2017 are rather impressive. Thanks to refurbished network technology, we achieved a total saving of 2,151,843 litres of water and 111,971,119 kg CO2. At the same time we avoid costs for disposal and waste. This is our contribution to environmental protection and the global battle against climate change. In cooperation with reliable partners, Green IT Solution has developed the Green IT Calculator to help make these figures clearer. It enables the water saved and carbon dioxide emissions avoided to be calculated for each product in our range. At the same time, the Calculator also works out how many trees would need to be planted in order to achieve the same reduction in CO2 emissions. So the contribution to environmental protection is already visible in the customer’s shopping basket. Choosing between new products and refurbished items is easier; it is not only the lower price which is an important reason for buying. We will be continuing our cooperation with Plant for the Planet in 2018. In this way, we demonstrate that using innovative and powerful hardware can be combined with saving resources and avoiding emissions and waste. At the end of this year, all our customers will be receiving another tree donation report with their individual environmental balance sheet. We hopefully anticipate many more tree donations from our customers.